The Wright Wreport: MBFW Day 1: Life's a Beach. Put on a Happy Face! 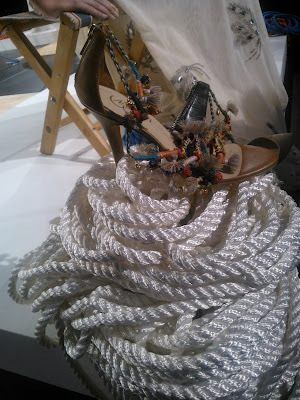 MBFW Day 1: Life's a Beach. Put on a Happy Face! A living, breathing, moving piece of art at David Tlale. Photo courtesy of Mercedes-Benz Fashion Week. WHY are they smiling? Art or obscenity? Does flotsam and jetsam live in a shoe? What a poser! Just a few of the questions and exclamations that the official kick off of Mercedes-Benz Fashion Week new York gave rise to. Not a bad start. Not at all. At Candela, life is footloose and fancy free. Photo by Yours Truly.